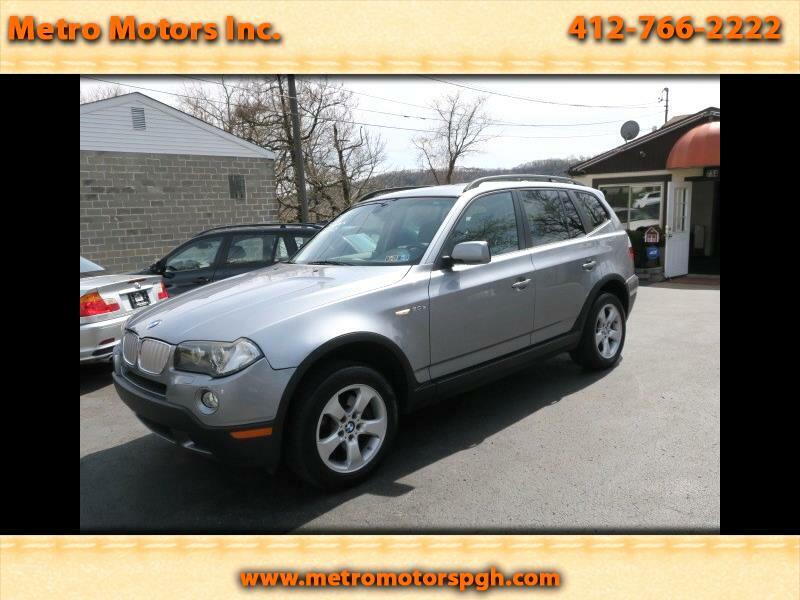 Super Clean 2008 BMW X3 3.0Si Sport Ute. This garage kept X3 has 85,396 Certified Miles. Finished in Titan Gray Metallic, with Light Dove Gray Premium Dakota Leather Interior with Burl Walnut Wood Trim. Both Front Seats are Heated, Power, Memory, Lumbar Adjusting Seats. Rear Heated Seats!! Premium Sound with CD, Satellite, Bluetooth. Full Optional Panoramic Double Glass Moon Roof. Roof Racks. Privacy Glass Tint. Full Power. Tilt & Telescopic Leather Steering Wheel with Command Buttons. Clean Car Fax showing No Accidents or Issues, and over 18 Qualified Service Records!! Just Serviced, Inspected, Smog Tested. Owners Wife drove this X3 All Winter and it is 100%!! Great Vehicle, Great Price! !